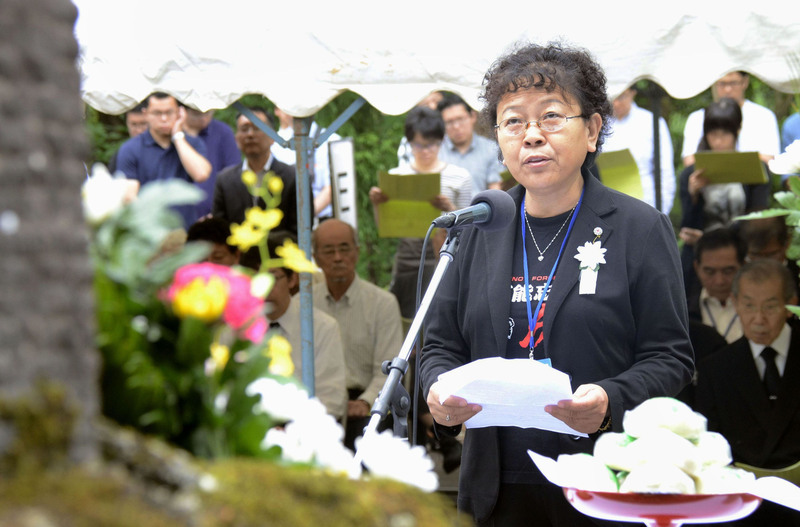 More than 100 mourners gathered Tuesday in honor of the victims of an uprising at a labor camp in northern Japan during World War II. Those present included 87-year-old Chinese survivor Zhang Guangxun and relatives of some of the more than 400 forced laborers who died in harsh conditions or through torture at the Hanaoka mining camp in Odate, Akita Prefecture. Some of those present who addressed the gathering described mixed emotions. Also present was Odate Mayor Junji Fukuhara. “This past tragedy should never be forgotten,” he said. On June 30, 1945, Chinese laborers at the camp, which was located near a copper mine, staged an uprising against their Japanese supervisors over working conditions. The mine was operated by a company that was a predecessor of the present-day Kajima Corp. construction firm. Overall, more than 400 of the camp’s Chinese laborers died there. The number includes those who perished in the uprising and those tortured to death in its aftermath. On Friday, a group of Chinese, including former Hanaoka laborers, filed a lawsuit in Osaka, seeking an apology and compensation from the Japanese government. “If Japan refuses to confront the past, we will never be able to establish amicable relations,” they said in their claim. “I want many people to learn about what happened to those who were brought to Japan for forced labor so they can pass our desire for peace on to the next generation,” said 70-year-old Song Mingyuan, a descendant of one of the forced laborers. Similar suits have been filed against the government in the past, but rulings on them have followed a Supreme Court judgment in 2007 that Chinese citizens can’t demand war reparations on the grounds that the right was forfeited under a postwar agreement between Japan and China. 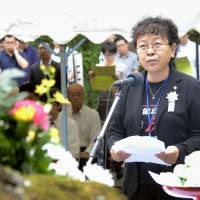 Kajima reached an agreement with a group of survivors and relatives of the deceased in 2000 to set up a ¥500 million fund to compensate victims of the camp. The 70th anniversary gathering represented in part an attempt by survivors and relatives of the Chinese workers to unearth the history of the camp. Reports have been compiled based on survivors’ testimony and numerous studies on the forced labor at Hanaoka. In all, 986 Chinese civilians and prisoners of war from five Chinese provinces were sent to the camp. But inmates also included Korean conscripts, Allied prisoners of war and Japanese laborers. The work involved moving ore cars in and out of the mine, repairing roads and excavating and cementing riverbeds. They also had to till farmland. Conditions were harsh. In winter they were given inadequate clothing and suffered from malnutrition. There are allegations the Chinese workers were subjected to increasing levels of physical and psychological abuse. The Foreign Ministry has reported that some 38,900 Chinese were brought to Japan for slave-like work and about 6,800 of them died. “The Hanaoka incident is a symbol (of wartime atrocities), but there were similar places across the country where workers had to labor under severe conditions and did not rise up,” said novelist Kenji Nozoe, 80, of Noshiro, Akita Prefecture. He is a member of a group examining wartime slave labor practices. Akita, Chinese, Koreans, Hanaoka, Kajima Corp.